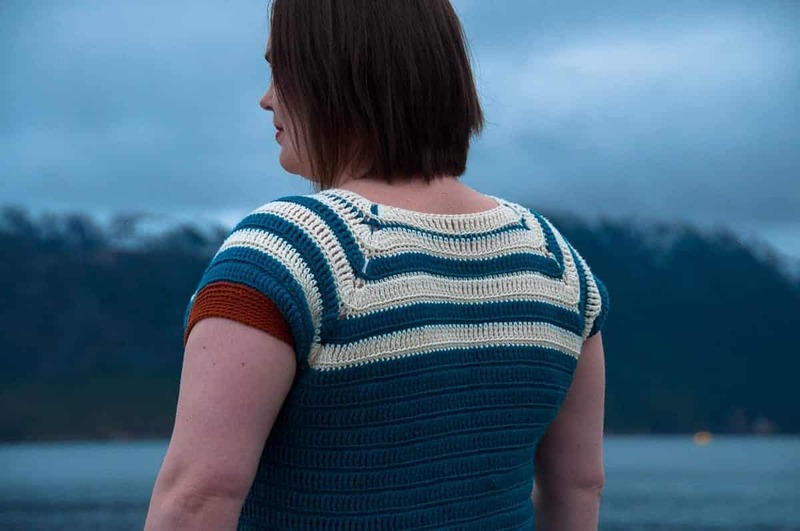 You’re going to love this crochet pattern for the crochet Fons Dress. First of all, if you love crocheting garments, this one is for you. The crochet Fons dress is really a great shaped dress for any occasion. It works just as well all year through. Switch up the colors & make it for the season you’d like. You’re going to need some crochet experience to make this dress, but if you’re a newbie crocheter, this one isn’t way to difficult. Not convinced this dress is for you? Well’ let me tell you, it’s definitely such a great piece to wear. Think dressing up a bit & still getting to wear something handmade. 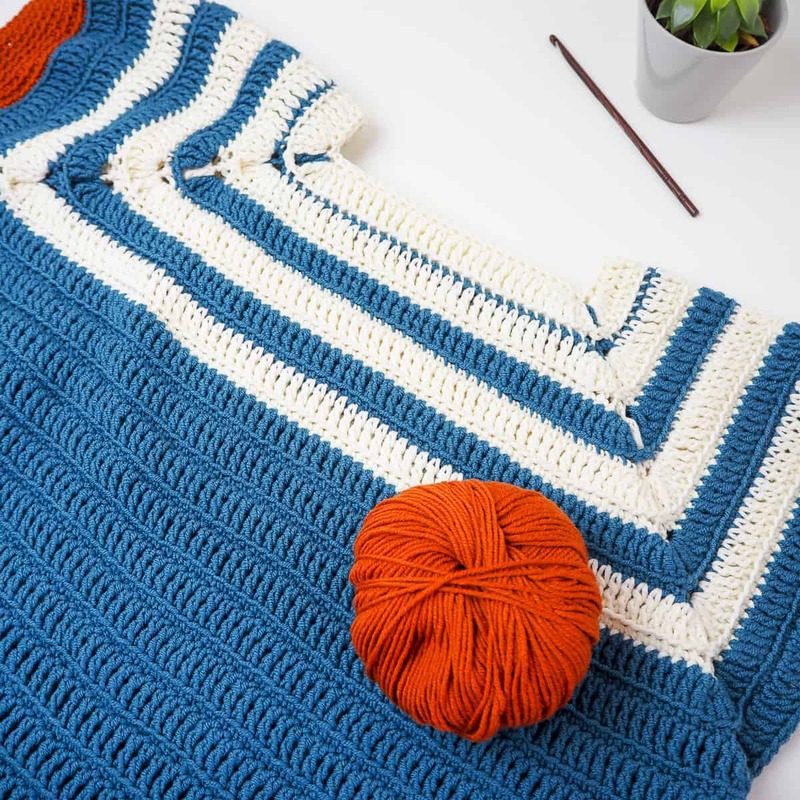 For the crochet Fons Dress you’re going to need either 50 % cotton & 50 % merino wool yarn or 100 % merino yarn. Such as the Cotton Merino & Merino Extra Fin from Drops. In the dress pictures a combination of those two yarns has been used. 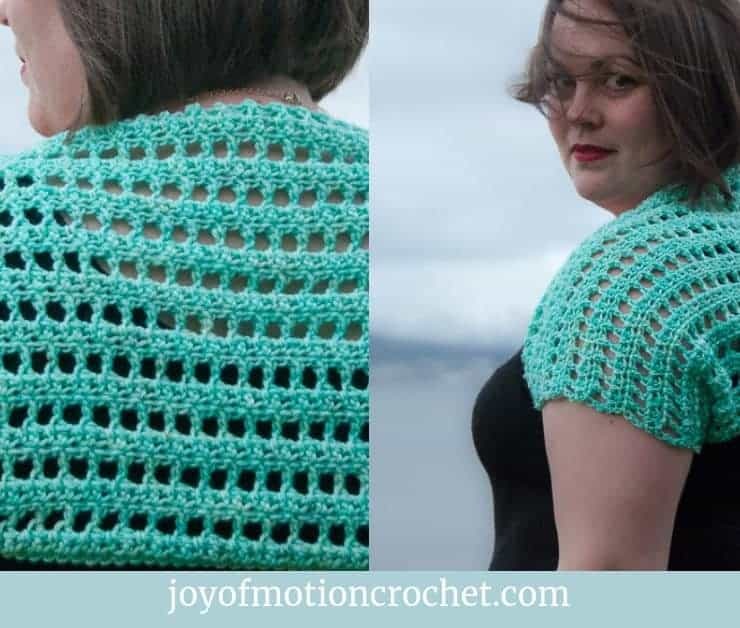 Have you been wanting to crochet a garment? Or more specifically a dress? Well, starting with this one the perfect opportunity! 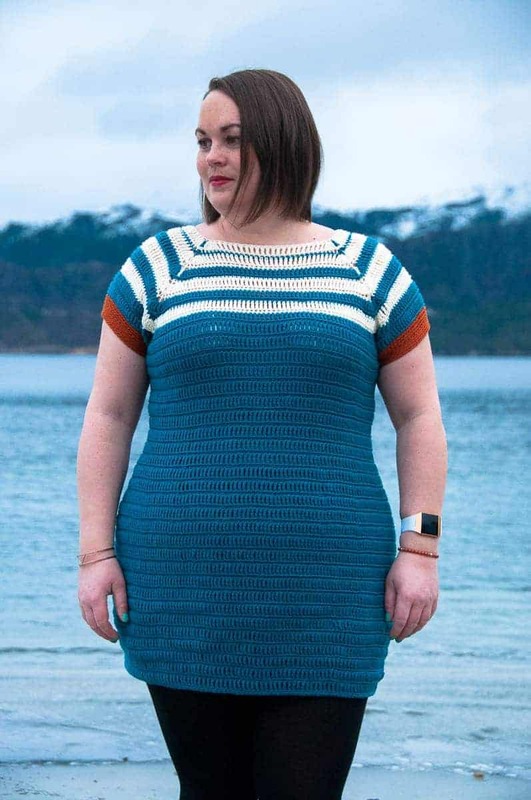 First of all, it’s not that difficult to crochet a dress. The only thing you have to make sure is to test the gauge & then you’re good to go. 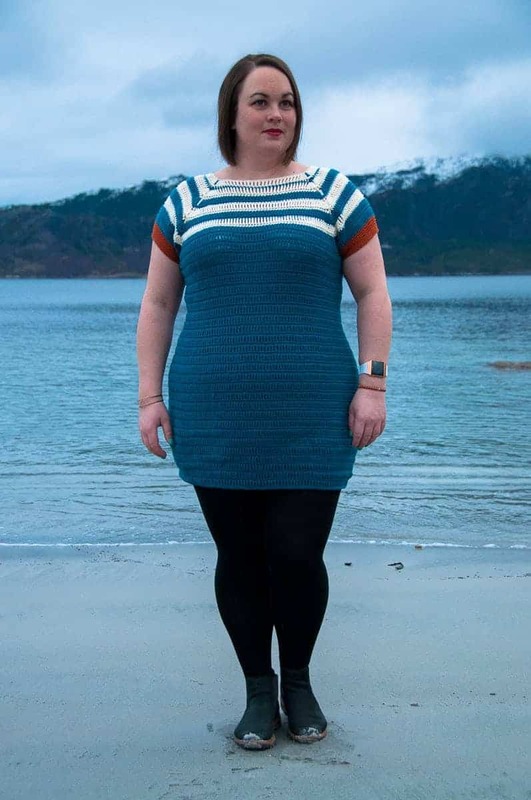 What’s great about this dress is the fact that it’s a raglan style crochet dress, which makes it possible to try it on while you make it. Then you can pick the size that fit’s the best while you crochet it. Since you like the crochet Fons dress, these might interest you too? The crochet Fons Dress is the perfect garment pattern when you’re looking to make something you want to wear over & over. It’s the perfect pattern to make to get all the compliments “Did you really make that?”. 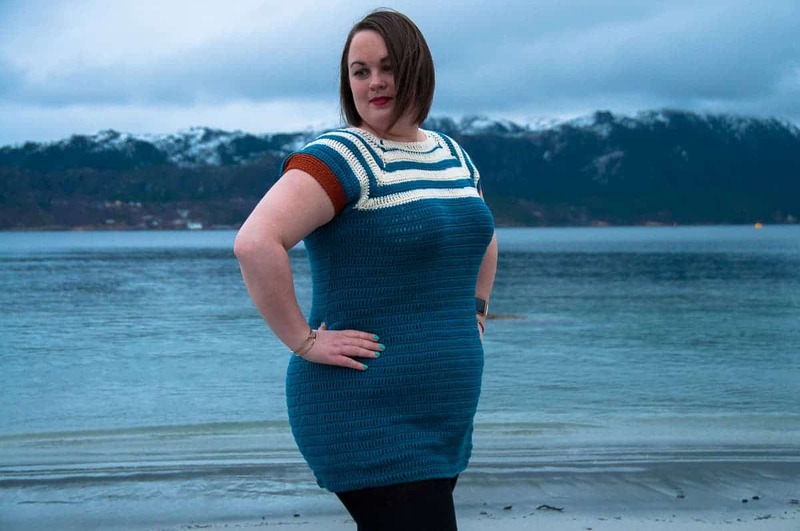 The best thing about the crochet Fons dress is that it’s quite easy to crochet. There’s also a great option to crochet this dress in just one color & make it more of a “classic” everyday dress. 16 stitches & 16 rows per 10 cm / 4”. 16 stitches & 5 rows per 10 cm / 4”. At the end of each row, the stitch count is given in parenthesis. 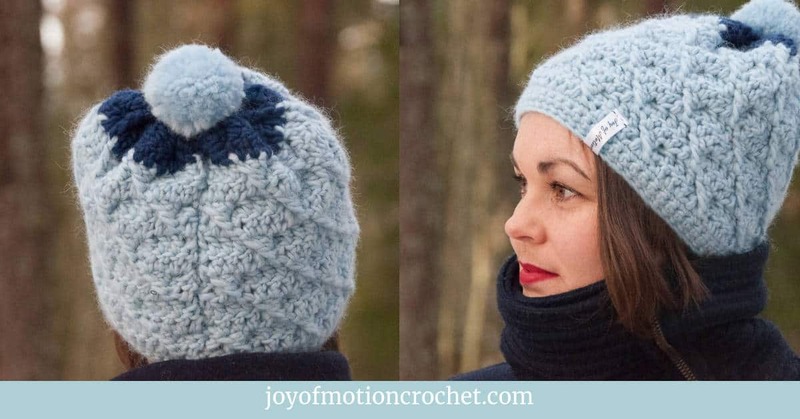 It includes starting chains & slip stitch. 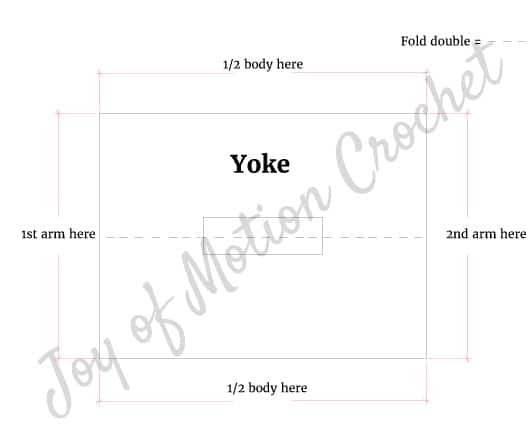 Placement of double treble crochet stitches (dtr) on yoke: On odd numbers (1st, 3rd, 5th, 7th), dtr stitches are placed after 4 tr from prev row, on even numbers (2nd, 4th, 6th, 8th) dtr stitches are placed before 4 tr from prev row. Try on yoke to make sure the yoke is wide enough to drop (slightly) off your shoulder on both sides. The corners will attach/meet under your arms when continuing the dress. For all sizes: Best places to adjust length by adding or reducing rows are: After round 10 before decreasing for waist, after round 18 before increasing after waist, after round 45 before decreasing after hips, or after round 56. For all sizes: Skip increase or decrease rows to adjust fit. 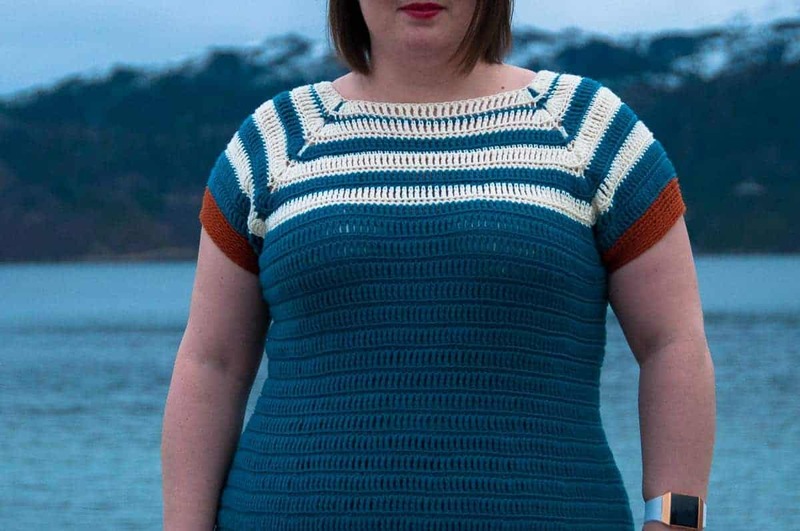 For all sizes: Best place to adjust length is by adding or reducing rows at the end. You will need to use the foundation single crochet stitch, chain, back loop single crochet, treble crochet, double treble crochet. Reach the stitch from the back of the 2 ch on the previous row & skip them. 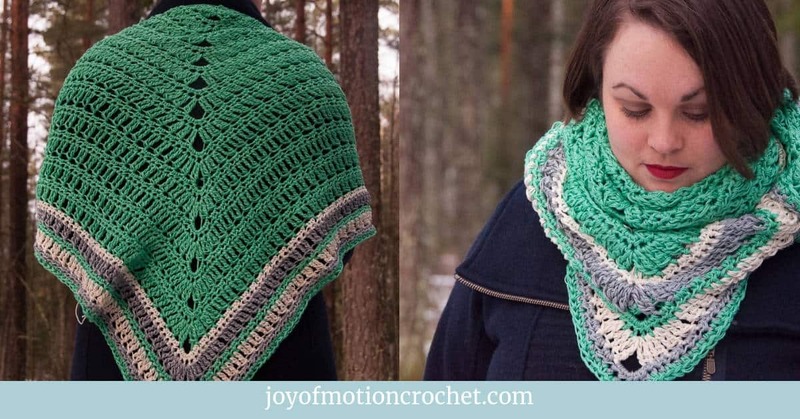 You will need to know how to change colors in crochet with different color on different rows. 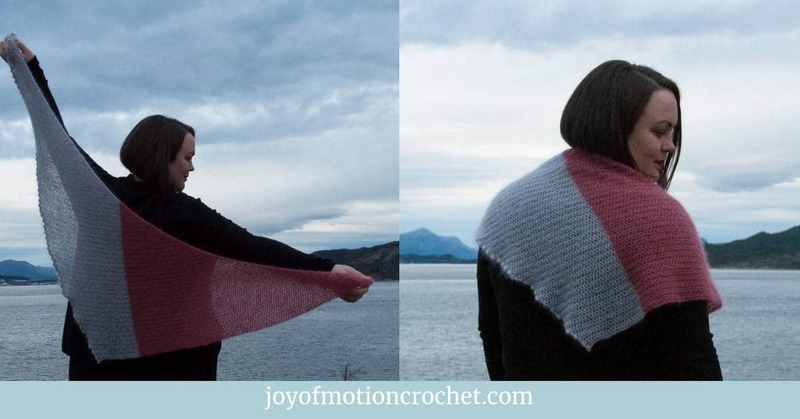 When working with different colors on different rows, you’ll never finish the last stitch on the last row with one color, with the color you where working with. Do all the steps of the stitch, then leave the last step unworked. Yarn over with the color for the next st & pull yarn through. Repeat this for every row you change colors to make the color changes look beautiful. With CA make 72 st using the FSC technique, sl st in 1st st (=73 st). Make sure you make them loose enough to fit your head. Round 1 (CA): Ch 3 st (counts as 1st st), tr 1 in the next 10 st, tr 4 in next st, ch 2 (do not sk st), tr 4 in next st, tr 1 in the next 22 st, tr 4 in the next st, ch 2 (do not sk st), tr 4 in the next st, tr 1 in the next 10 st, tr 4 in the next st, ch 2 (do not sk st), tr 4 in the next st, tr 1 in the next 22 st, tr 4 in the next st, ch 2 (do not sk st), tr 3 in the sl st from start round, sl st in the 3rd ch from beg of round (=105 st). Round 2 (CB): Ch 1 (counts as 1st st), BLsc 1 in the next 14 st, dtr 1 in 1st st you placed 4 tr in on prev row, dtr 1 in 2nd st you placed 4 tr in on prev row, BLsc 1 in the next 30 st, dtr 1 in 3rd st you placed 4 tr in on prev row, dtr 1 in 4th st you placed 4 tr in on prev row, BLsc 1 in the next 18 st, dtr 1 in 5th st you placed 4 tr in on prev row, dtr 1 in 6th st you placed 4 tr in on prev row, BLsc in the next 30 st, dtr 1 in 7th st you placed 4 tr st in on prev row, dtr 1 in 8th st you placed 4 tr st in on prev row, BLsc 1 in the next 3 st, sl st in ch from beg of round (= 105 st). Round 3 (CA): Ch 3 st (counts as 1st st), tr 1 in the next 14 st, tr 4 in next st, ch 2 (do not sk st), tr 4 in next st, tr 1 in the next 30 st, tr 4 in the next st, ch 2 (do not sk st), tr 4 in the next st, tr 1 in the next 18 st, tr 4 in the next st, ch 2 (do not sk st), tr 4 in the next st, tr 1 in the next 30 st, tr 4 in the next st, ch 2 (do not sk st), tr 4 in the next st, tr 1 in the next 3 st, sl st in the 3rd ch from beg of round (=137 st). Short description of rows 4 – 7 (9) 11 (13) 15 (17) 19 (21) 23: Rep row 2 & 3 and keep increasing 32 st on each odd row, by doing 4 tr in 1 st before & after each ch 2 corner. Find rows written out below with color specified for each row. Round 4 (CA): Ch 1 (counts as 1st st), BLsc 1 in the next 18 st, dtr 1 in 1st st you placed 4 tr in on prev row, dtr 1 in 2nd st you placed 4 tr in on prev row, BLsc 1 in the next 38 st, dtr 1 in 3rd st you placed 4 tr in on prev row, dtr 1 in 4th st you placed 4 tr in on prev row, BLsc 1 in the next 26 st, dtr 1 in 5th st you placed 4 tr in on prev row, dtr 1 in 6th st you placed 4 tr in on prev row, BLsc in the next 38 st, dtr 1 in 7th st you placed 4 tr st in on prev row, dtr 1 in 8th st you placed 4 tr st in on prev row, BLsc 1 in the next 7 st, sl st in ch from beg of round (= 137 st). Round 5 (CB): Ch 3 st (counts as 1st st), tr 1 in the next 18 st, tr 4 in next st, ch 2 (do not sk st), tr 4 in next st, tr 1 in the next 38 st, tr 4 in the next st, ch 2 (do not sk st), tr 4 in the next st, tr 1 in the next 26 st, tr 4 in the next st, ch 2 (do not sk st), tr 4 in the next st, tr 1 in the next 38 st, tr 4 in the next st, ch 2 (do not sk st), tr 4 in the next st, tr 1 in the next 7 st, sl st in the 3rd ch from beg of round (=169 st). Round 6 (CA): Ch 1 (counts as 1st st), BLsc 1 in the next 22 st, dtr 1 in 1st st you placed 4 tr in on prev row, dtr 1 in 2nd st you placed 4 tr in on prev row, BLsc 1 in the next 46 st, dtr 1 in 3rd st you placed 4 tr in on prev row, dtr 1 in 4th st you placed 4 tr in on prev row, BLsc 1 in the next 34 st, dtr 1 in 5th st you placed 4 tr in on prev row, dtr 1 in 6th st you placed 4 tr in on prev row, BLsc in the next 46 st, dtr 1 in 7th st you placed 4 tr st in on prev row, dtr 1 in 8th st you placed 4 tr st in on prev row, BLsc 1 in the next 11 st, sl st in ch from beg of round (= 169 st). Round 7 (CA): Ch 3 st (counts as 1st st), tr 1 in the next 22 st, tr 4 in next st, ch 2 (do not sk st), tr 4 in next st, tr 1 in the next 46 st, tr 4 in the next st, ch 2 (do not sk st), tr 4 in the next st, tr 1 in the next 34 st, tr 4 in the next st, ch 2 (do not sk st), tr 4 in the next st, tr 1 in the next 46 st, tr 4 in the next st, ch 2 (do not sk st), tr 4 in the next st, tr 1 in the next 11 st, sl st in the 3rd ch from beg of round (=201 st). Round 8 (CA): Ch 1 (counts as 1st st), BLsc 1 in the next 26 st, dtr 1 in 1st st you placed 4 tr in on prev row, dtr 1 in 2nd st you placed 4 tr in on prev row, BLsc 1 in the next 54 st, dtr 1 in 3rd st you placed 4 tr in on prev row, dtr 1 in 4th st you placed 4 tr in on prev row, BLsc 1 in the next 42 st, dtr 1 in 5th st you placed 4 tr in on prev row, dtr 1 in 6th st you placed 4 tr in on prev row, BLsc in the next 54 st, dtr 1 in 7th st you placed 4 tr st in on prev row, dtr 1 in 8th st you placed 4 tr st in on prev row, BLsc 1 in the next 15 st, sl st in ch from beg of round (= 201 st). Round 9 (CB): Ch 3 st (counts as 1st st), tr 1 in the next 26 st, tr 4 in next st, ch 2 (do not sk st), tr 4 in next st, tr 1 in the next 54 st, tr 4 in the next st, ch 2 (do not sk st), tr 4 in the next st, tr 1 in the next 42 st, tr 4 in the next st, ch 2 (do not sk st), tr 4 in the next st, tr 1 in the next 54 st, tr 4 in the next st, ch 2 (do not sk st), tr 4 in the next st, tr 1 in the next 15 st, sl st in the 3rd ch from beg of round (=233 st). Round 10 (CB): Ch 1 (counts as 1st st), BLsc 1 in the next 30 st, dtr 1 in 1st st you placed 4 tr in on prev row, dtr 1 in 2nd st you placed 4 tr in on prev row, BLsc 1 in the next 62 st, dtr 1 in 3rd st you placed 4 tr in on prev row, dtr 1 in 4th st you placed 4 tr in on prev row, BLsc 1 in the next 50 st, dtr 1 in 5th st you placed 4 tr in on prev row, dtr 1 in 6th st you placed 4 tr in on prev row, BLsc in the next 62 st, dtr 1 in 7th st you placed 4 tr st in on prev row, dtr 1 in 8th st you placed 4 tr st in on prev row, BLsc 1 in the next 19 st, sl st in ch from beg of round (=233 st). Round 11 (CA): Ch 3 st (counts as 1st st), tr 1 in the next 30 st, tr 4 in next st, ch 2 (do not sk st), tr 4 in next st, tr 1 in the next 62 st, tr 4 in the next st, ch 2 (do not sk st), tr 4 in the next st, tr 1 in the next 50 st, tr 4 in the next st, ch 2 (do not sk st), tr 4 in the next st, tr 1 in the next 62 st, tr 4 in the next st, ch 2 (do not sk st), tr 4 in the next st, tr 1 in the next 19 st, sl st in the 3rd ch from beg of round (=265 st). Round 12 (CA): Ch 1 (counts as 1st st), BLsc 1 in the next 34 st, dtr 1 in 1st st you placed 4 tr in on prev row, dtr 1 in 2nd st you placed 4 tr in on prev row, BLsc 1 in the next 70 st, dtr 1 in 3rd st you placed 4 tr in on prev row, dtr 1 in 4th st you placed 4 tr in on prev row, BLsc 1 in the next 58 st, dtr 1 in 5th st you placed 4 tr in on prev row, dtr 1 in 6th st you placed 4 tr in on prev row, BLsc in the next 70 st, dtr 1 in 7th st you placed 4 tr st in on prev row, dtr 1 in 8th st you placed 4 tr st in on prev row, BLsc 1 in the next 23 st, sl st in ch from beg of round (=265 st). Round 13 (CB): Ch 3 st (counts as 1st st), tr 1 in the next 34 st, tr 4 in next st, ch 2 (do not sk st), tr 4 in next st, tr 1 in the next 70 st, tr 4 in the next st, ch 2 (do not sk st), tr 4 in the next st, tr 1 in the next 58 st, tr 4 in the next st, ch 2 (do not sk st), tr 4 in the next st, tr 1 in the next 70 st, tr 4 in the next st, ch 2 (do not sk st), tr 4 in the next st, tr 1 in the next 23 st, sl st in the 3rd ch from beg of round (=297 st). Round 14 (CB): Ch 1 (counts as 1st st), BLsc 1 in the next 38 st, dtr 1 in 1st st you placed 4 tr in on prev row, dtr 1 in 2nd st you placed 4 tr in on prev row, BLsc 1 in the next 78 st, dtr 1 in 3rd st you placed 4 tr in on prev row, dtr 1 in 4th st you placed 4 tr in on prev row, BLsc 1 in the next 66 st, dtr 1 in 5th st you placed 4 tr in on prev row, dtr 1 in 6th st you placed 4 tr in on prev row, BLsc in the next 78 st, dtr 1 in 7th st you placed 4 tr st in on prev row, dtr 1 in 8th st you placed 4 tr st in on prev row, BLsc 1 in the next 27 st, sl st in ch from beg of round (= 297 st). Round 15 (CB): Ch 3 st (counts as 1st st), tr 1 in the next 38 st, tr 4 in next st, ch 2 (do not sk st), tr 4 in next st, tr 1 in the next 78 st, tr 4 in the next st, ch 2 (do not sk st), tr 4 in the next st, tr 1 in the next 66 st, tr 4 in the next st, ch 2 (do not sk st), tr 4 in the next st, tr 1 in the next 78 st, tr 4 in the next st, ch 2 (do not sk st), tr 4 in the next st, tr 1 in the next 27 st, sl st in the 3rd ch from beg of round (=329 st). Round 16 (CA): Ch 1 (counts as 1st st), BLsc 1 in the next 42 st, dtr 1 in 1st st you placed 4 tr in on prev row, dtr 1 in 2nd st you placed 4 tr in on prev row, BLsc 1 in the next 86 st, dtr 1 in 3rd st you placed 4 tr in on prev row, dtr 1 in 4th st you placed 4 tr in on prev row, BLsc 1 in the next 74 st, dtr 1 in 5th st you placed 4 tr in on prev row, dtr 1 in 6th st you placed 4 tr in on prev row, BLsc in the next 86 st, dtr 1 in 7th st you placed 4 tr st in on prev row, dtr 1 in 8th st you placed 4 tr st in on prev row, BLsc 1 in the next 31 st, sl st in ch from beg of round (= 329 st). Round 17 (CB): Ch 3 st (counts as 1st st), tr 1 in the next 42 st, tr 4 in next st, ch 2 (do not sk st), tr 4 in next st, tr 1 in the next 86 st, tr 4 in the next st, ch 2 (do not sk st), tr 4 in the next st, tr 1 in the next 74 st, tr 4 in the next st, ch 2 (do not sk st), tr 4 in the next st, tr 1 in the next 86 st, tr 4 in the next st, ch 2 (do not sk st), tr 4 in the next st, tr 1 in the next 31 st, sl st in the 3rd ch from beg of round (= 361 st). Round 18 (CB): Ch 1 (counts as 1st st), BLsc 1 in the next 46 st, dtr 1 in 1st st you placed 4 tr in on prev row, dtr 1 in 2nd st you placed 4 tr in on prev row, BLsc 1 in the next 94 st, dtr 1 in 3rd st you placed 4 tr in on prev row, dtr 1 in 4th st you placed 4 tr in on prev row, BLsc 1 in the next 82 st, dtr 1 in 5th st you placed 4 tr in on prev row, dtr 1 in 6th st you placed 4 tr in on prev row, BLsc in the next 94 st, dtr 1 in 7th st you placed 4 tr st in on prev row, dtr 1 in 8th st you placed 4 tr st in on prev row, BLsc 1 in the next 35 st, sl st in ch from beg of round (= 361 st). Round 19 (CB): Ch 3 st (counts as 1st st), tr 1 in the next 46 st, tr 4 in next st, ch 2 (do not sk st), tr 4 in next st, tr 1 in the next 94 st, tr 4 in the next st, ch 2 (do not sk st), tr 4 in the next st, tr 1 in the next 82 st, tr 4 in the next st, ch 2 (do not sk st), tr 4 in the next st, tr 1 in the next 94 st, tr 4 in the next st, ch 2 (do not sk st), tr 4 in the next st, tr 1 in the next 35 st, sl st in the 3rd ch from beg of round (= 393 st). Round 20 (CB): Ch 1 (counts as 1st st), BLsc 1 in the next 50 st, dtr 1 in 1st st you placed 4 tr in on prev row, dtr 1 in 2nd st you placed 4 tr in on prev row, BLsc 1 in the next 102 st, dtr 1 in 3rd st you placed 4 tr in on prev row, dtr 1 in 4th st you placed 4 tr in on prev row, BLsc 1 in the next 90 st, dtr 1 in 5th st you placed 4 tr in on prev row, dtr 1 in 6th st you placed 4 tr in on prev row, BLsc in the next 102 st, dtr 1 in 7th st you placed 4 tr st in on prev row, dtr 1 in 8th st you placed 4 tr st in on prev row, BLsc 1 in the next 39 st, sl st in ch from beg of round (=393 st). Round 21 (CA): Ch 3 st (counts as 1st st), tr 1 in the next 50 st, tr 4 in next st, ch 2 (do not sk st), tr 4 in next st, tr 1 in the next 102 st, tr 4 in the next st, ch 2 (do not sk st), tr 4 in the next st, tr 1 in the next 90 st, tr 4 in the next st, ch 2 (do not sk st), tr 4 in the next st, tr 1 in the next 102 st, tr 4 in the next st, ch 2 (do not sk st), tr 4 in the next st, tr 1 in the next 39 st, sl st in the 3rd ch from beg of round (= 425 st). Round 22 (CB): Ch 1 (counts as 1st st), BLsc 1 in the next 54 st, dtr 1 in 1st st you placed 4 tr in on prev row, dtr 1 in 2nd st you placed 4 tr in on prev row, BLsc 1 in the next 110 st, dtr 1 in 3rd st you placed 4 tr in on prev row, dtr 1 in 4th st you placed 4 tr in on prev row, BLsc 1 in the next 98 st, dtr 1 in 5th st 110 you placed 4 tr in on prev row, dtr 1 in 6th st you placed 4 tr in on prev row, BLsc in the next 12 st, dtr 1 in 7th st you placed 4 tr st in on prev row, dtr 1 in 8th st you placed 4 tr st in on prev row, BLsc 1 in the next 43 st, sl st in ch from beg of round (= 425 st). Round 23 (CB): Ch 3 st (counts as 1st st), tr 1 in the next 54 st, tr 4 in next st, ch 2 (do not sk st), tr 4 in next st, tr 1 in the next 110 st, tr 4 in the next st, ch 2 (do not sk st), tr 4 in the next st, tr 1 in the next 98 st, tr 4 in the next st, ch 2 (do not sk st), tr 4 in the next st, tr 1 in the next 110 st, tr 4 in the next st, ch 2 (do not sk st), tr 4 in the next st, tr 1 in the next 43 st, sl st in the 3rd ch from beg of round (=457 st). Repeats on both sides. Continue crocheting on yoke for the arms. Attach thread to 2nd corner chain on short side of yoke. 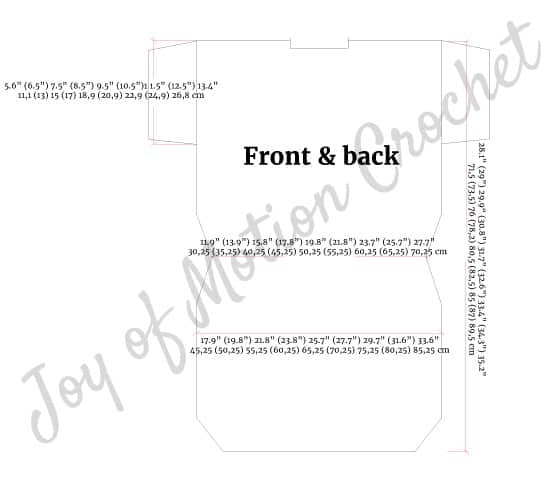 So you can continue crocheting alongside the short side on round 1. Round 1: Ch 1 (counts as 1st st), BLsc 1 in the next 42 (50) 58 (66) 74 (82) 90 (99) 98, 106, sc 1 in 1st corner chain, sl st in 1st st (=45 (53) 61 (69) 77 (85) 93 (101) 109 st). Round 2: Ch 1 st (counts as 1st st), BLsc 1 in the next 3 (2) 2 (2) 2 (2) 2 (1) 1 st, BLsc 2 tog, *BLsc 1 in the next 4 (3) 3 (3) 3 (3) 3 (2) 2 st, BLsc 2 tog*, repeat from *to* until end of round, decreasing (7 (9) 11 (13) 15 (17) 19 (21) 23 times, BLsc 1 in remaining st, sl st in 1st st (= 38 (44) 50 (56) 62 (68) 74 (80) 86 st). Round 3: Ch 1 st (counts as 1st st), BLsc in all st from prev round, sl st in 1st st from beg of round (= 38 (44) 50 (56) 62 (68) 74 (80) 86 st). Round 4: Ch 1 st (counts as 1st st), BLsc 1 in the next 6 (4) 3 (2) 2 (2) 2 (2) 1 st, BLsc 2 tog, *BLsc 1 in the next 7 (5) 4 (3) 3 (3) 3 (3) 2 st, BLsc 2 tog*, repeat from *to* until end of round, decreasing (4 (6) 8 (10) 12 (14) 16 (18) 20 times, BLsc 1 in remaining st, sl st in 1st st (= 34 (38) 42 (46) 50 (54) 58 (62) 66 st). Round 5-8: Rep round 3. Continue crocheting on yoke for the body. Attach thread to 2nd corner ch from last row on yoke, starting on the long side of yoke. Round 1: Ch 1 (counts as 1st st), Ch 1 (counts as 1st st), BLsc 1 in the next 110 (126) 142 (158) 174 (190) 206 (222) 238, sc 1 in 1st corner chain, sl st in 1st st (=113 (129) 145 (161) 177 (193) 209 (225) 241 st). Round 2: Ch 3 st (counts as 1st st), tr 1 in all st from prev round, sl st in 3rd ch from beg of round (=113 (129) 145 (161) 177 (193) 209 (225) 241 st). Round 3: Ch 1 st (counts as 1st st), BLsc in all st from prev round, sl st in 1st st from beg of round (=113 (129) 145 (161) 177 (193) 209 (225) 241 st). Round 4-10: Rep rows 2 & 3 every other row (=113 (129) 145 (161) 177 (193) 209 (225) 241 st). Round 11: Ch 1 st (counts as 1st st), BLsc 1 in the next 4 (5) 6 (7) 8 (9) 10 (11) 12 st, BLsc 2 tog, *BLsc 1 in the next 5 (6) 7 (8) 9 (10) 11 (12) 13 st, BLsc 2 tog*, repeat from *to* until end of round, decreasing 16 times, BLsc 1 in remaining st, sl st in 1st st (= 97 (113) 129 (145) 161 (177) 193 (209) 225 st). Round 12-18: Rep rows 2 & 3 every other row (= 97 (113) 129 (145) 161 (177) 193 (209) 225 st). Round 19: Ch 1 st (counts as 1st st), BLsc 1 in the next 4 (5) 6 (7) 8 (9) 10 (11) 12 st, BLsc 2 st in next st, *BLsc 1 in the next 5 (6) 7 (8) 9 (10) 11 (12) 13 st, BLsc 2 st in next st*, repeat from *to* until end of round, increasing 16 times, BLsc 1 in remaining st, sl st in 1st st (=113 (129) 145 (161) 177 (193) 209 (225) 241 st). Round 20-22: Rep rows 2 & 3 every other row (=113 (129) 145 (161) 177 (193) 209 (225) 241 st). Round 23: Ch 1 st (counts as 1st st), BLsc 1 in the next 5 (6) 7 (8) 9 (10) 11 (12) 13 st, BLsc 2 st in next st, *BLsc 1 in the next 6 (7) 8 (9) 10 (11) 12 (13) 14 st, BLsc 2 st in next st*, repeat from *to* until end of round, increasing 16 times, BLsc 1 in remaining st, sl st in 1st st (=129 (145) 161 (177) 193 (209) 225 (241) 257 st). Round 24-26: Rep rows 2 & 3 every other row (=129 (145) 161 (177) 193 (209) 225 (241) 257 st). Round 27: Ch 1 st (counts as 1st st), BLsc 1 in the next 6 (7) 8 (9) 10 (11) 12 (13) 14 st, BLsc 2 st in next st, *BLsc 1 in the next 7 (8) 9 (10) 11 (12) 13 (14) 15 st, BLsc 2 st in next st*, repeat from *to* until end of round, increasing 16 times, BLsc 1 in remaining st, sl st in 1st st (=145 (161) 177 (193) 209 (225) 241 (257) 273 st). Round 28-42: Rep rows 2 & 3 every other row (=145 (161) 177 (193) 209 (225) 241 (257) 273 st). Round 43: Ch 1 st (counts as 1st st), BLsc 1 in the next 6 (7) 8 (9) 10 (11) 12 (13) 14 st, BLsc 2 tog, *BLsc 1 in the next 7 (8) 9 (10) 11 (12) 13 (14) 15 st, BLsc 2 tog*, repeat from *to* until end of round, decreasing 16 times, BLsc 1 in remaining st, sl st in 1st st (=129 (145) 161 (177) 193 (209) 225 (241) 257 st). Round 44-46: Rep rows 2 & 3 every other row (=129 (145) 161 (177) 193 (209) 225 (241) 257 st). Round 47: Ch 1 st (counts as 1st st), BLsc 1 in the next 5 (6) 7 (8) 9 (10) 11 (12) 13 st, BLsc 2 tog, *BLsc 1 in the next 6 (7) 8 (9) 10 (11) 12 (13) 14 st, BLsc 2 tog*, repeat from *to* until end of round, decreasing 16 times, BLsc 1 in remaining st, sl st in 1st st (=113 (129) 145 (161) 177 (193) 209 (225) 241 st). Round 48-50: Rep rows 2 & 3 every other row (=113 (129) 145 (161) 177 (193) 209 (225) 241 st). Round 51: Ch 1 st (counts as 1st st), BLsc 1 in the next 4 (5) 6 (7) 8 (9) 10 (11) 12 st, BLsc 2 tog, *BLsc 1 in the next 5 (6) 7 (8) 9 (10) 11 (12) 13 st, BLsc 2 tog*, repeat from *to* until end of round, decreasing 16 times, BLsc 1 in remaining st, sl st in 1st st (= 97 (113) 129 (145) 161 (177) 193 (209) 225 st). Round 52-56: Rep rows 2 & 3 every other row (= 97 (113) 129 (145) 161 (177) 193 (209) 225 st). I really hope you liked the crochet Fons Dress! However, if you really like it, make sure to share the FREE pattern & share pictures of your crochet Fons dress that you’ve made with me. 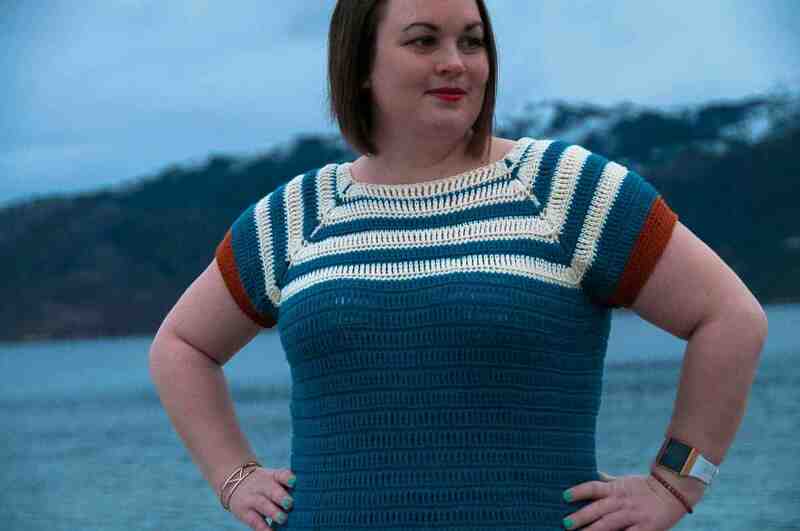 Share your finished crochet Fons Dress on Love Crochet. 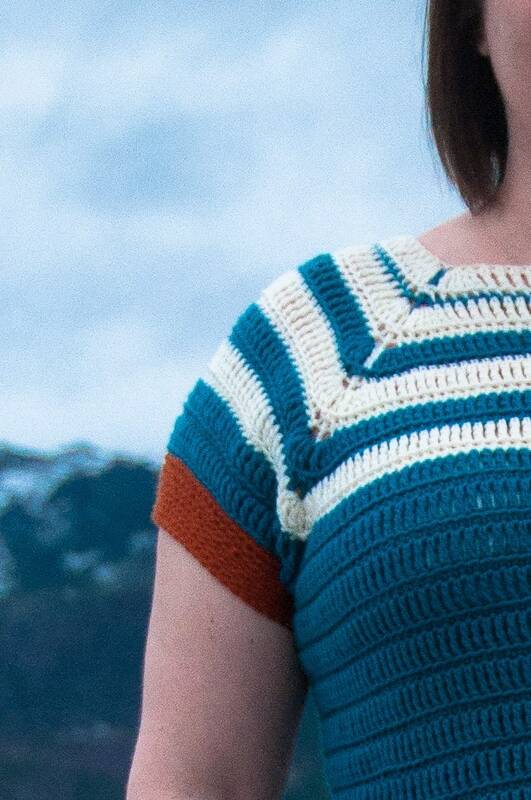 Share your finished crochet Fons Dress on Ravelry. i love top down constructions and this dress is gorgeous! Thank you 🙂 After trying top down construction for the first time I was “hooked”, love designing from the top down 🙂 Happy to hear I’m not alone! 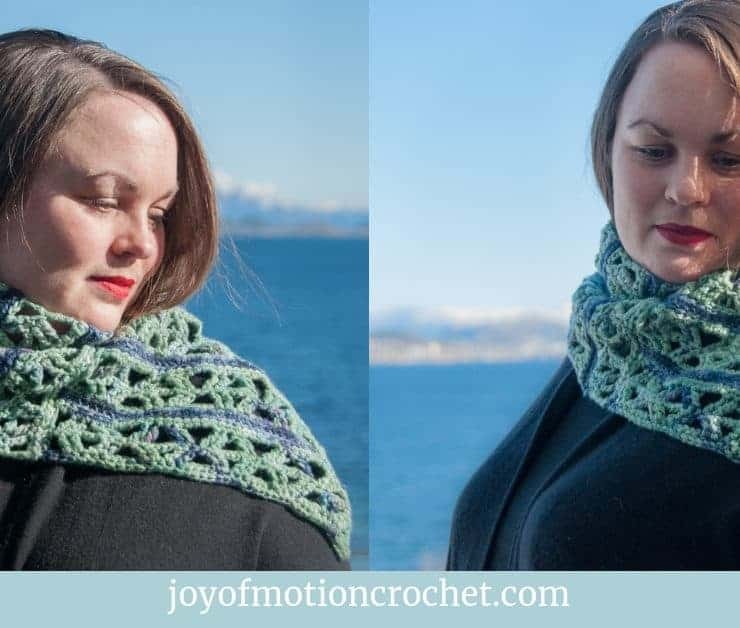 I love this pattern, think I’ll try to make it after the holidays. I would love to make this dress but I’m still learning and I wonder if ‘easy’ is easy enough for me to attempt. This has skill level intermediate 🙂 I describe it as easy, because I think that you absolutely could make it if you know how to follow easy patterns as well. The stitches isn’t that hard, but you will have to know how to crochet in the back loop. Another one for my to make list!